After receiving his D.D.S. (Doctor of Dental Science) degree from Tishreen University in 1994, Dr. Tabbah enrolled at Tufts University in Boston, where he achieved recognition on the Dean’s Honor Roll for performance on the National Dental Boards, and earned a D.M.D. (Doctor of Dental Medicine) degree in 2001. 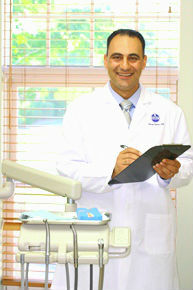 Since then he has been practicing all phases of dentistry, focusing on painless dental care. Doctor Tabbah is always participating in continuing education and training to stay up to date with the latest dental technology.